With hot winds blowing over the sand dunes, a world of colors bright and vibrant opens for us at the Rann Utsav, White Desert Festival in India. A weekend at the Rann of Kutch is a truly sultry dream come true…with the vast expanse of the white desert sand, a folk festival to indulge in and cuisine to die for. What more could you ask for in a holiday? Rann Utsav, White Desert Carnival is an annual festival held at the Rann of Kutch located in the state of Gujarat. A celebration of culture, heritage, and the beckoning white sand, this three-month-long festival happens from November to February. The explosion of colors and hues that await the traveler at this festival can only be experienced and those who have savored it come back again and again. The Rann of Kutch is a geographical wonder situated in the heart of the Thar Desert in Gujarat that borders the Sind province of Pakistan. ‘Rann’ is derived from Hindi word that means ‘desert’. Kutch means something that is both interminably wet and dry which is rather true to its name because large areas here are a shallow wetland that is submerged in water during the summer and monsoon seasons. The Rann is famous for its marshy salt flatland that becomes white sand when the shallow water dries right before the monsoon rains. This haven of white sand is as picture perfect as one can imagine it to be. The beautiful expanse of this unending desert land is an experience to savor, especially on a full moon night. The white sands and the full moon certainly makes up the stuff that romance is made of and Rann of Kutch is one place where it becomes a breathtaking experience. Chir Bhatti is yet another phenomenon that the Rann is famous for. Chir Bhatti in the local Kutchi- Sindhi language means ‘Ghost light’. It is an unexplained phenomenon that people in the area have been noticing for centuries at length. According to many, the colorful lights appear on a dark night and they move through the sky in a pear-shaped form. The lights move as fast as an arrow and sometimes they slow down, playing hide and seek with many who watch for it. If you can get your eyes away from the beauty of these desert lands and ghost lights then you would also note that Kutch is a place that is well known for its arts and craftsmanship. Exquisitely original, Kutch has much more to offer its visitors – colorful weaving, delicate patchwork, popular block printing, enticing bandini silks, tie-and-die, rogan art, ethnic embroidery, metal craft, shell craft… the list is endless. In other words, it is a paradise for shopaholics! The terrain of Rann is enchantingly white and makes a great background to showcase arts and crafts that literally explode with color. The Rann Utsav festival has been attracting foreigners, desert lovers and travelers in India since 2006 since our Honorable Prime Minister Narendra Modi (the then Chief Minister of Gujarat) conceived and visualized this endless festival as a sublime treat for all senses. His efforts paid forth, as today Rann Utsav is one of the most anticipated annual events in Gujarat that beckons thousands of people from all over the world. 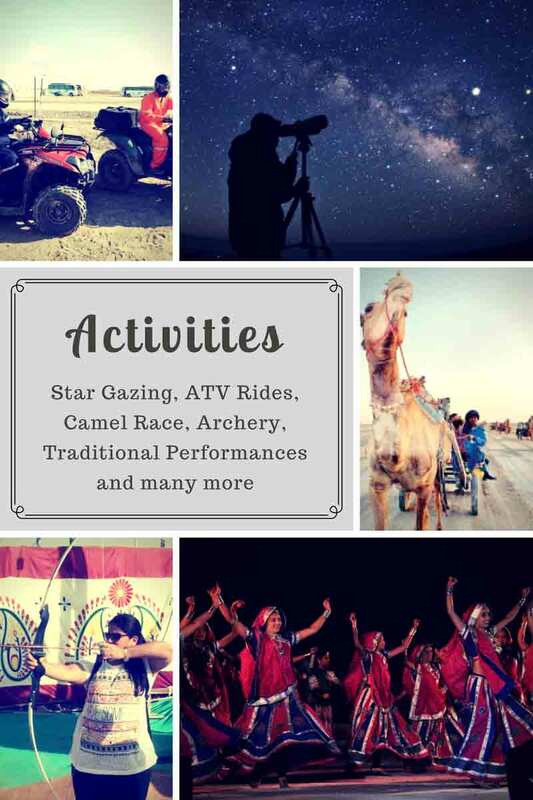 Rann Utsav, White Desert Festival – What to Expect? Imagine this… picturesque pure white sand, cool desert winds, a full moon night and a carnival of colors, aroma of spice, lithe dancers, and lumbering camels. Well, that’s what you will get when you sign up for a Rann Utsav White Desert Carnival holiday. A celebration of colors Rann Utsav that showcases the best of Indian culture and Gujarat’s legendary hospitality and appetite for life. This may sound like Arabian Nights but let us assure you that it is, albeit with a lot more color, music, and grace. 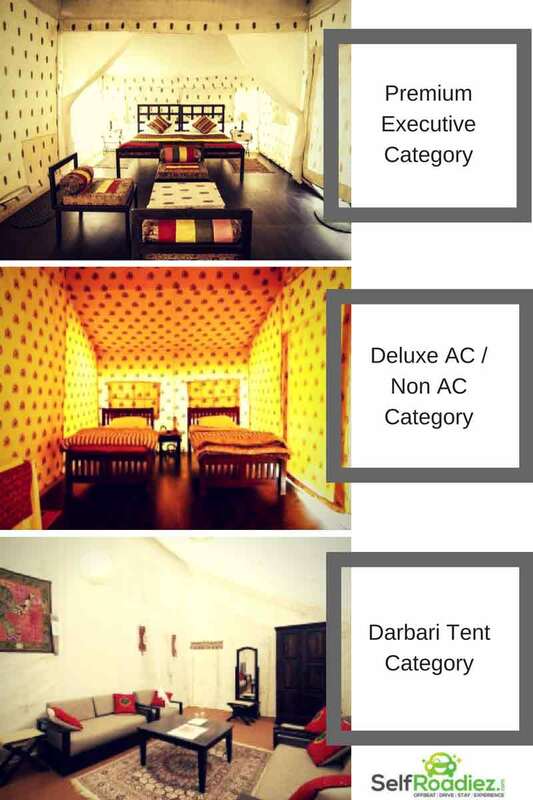 During the Rann Utsav, tent cities spring in Bhuj and Dhordo where one can hire tents ranging from economy to AC and enjoy the best that Rann Utsav offers. Travelers swear by all things holy that nothing in this world can surpass the delights of having a tented holiday in the middle of the desert. Since the festival is held during the winter months, the weather is excellent for sightseeing and to spend a relaxing afternoon in the tent dreaming of desert beauties. One can also hire Swiss AC tents complete with water heaters and air conditioning to enhance their holiday experience. If a tent is certainly not your thing, then no worries, there are umpteen hotels at Dhordo and Bhuj ranging from luxury heritage to budget where you will find accommodation. The cuisine is certainly a part of any festival and one can’t go to Rann Utsav and not taste the awesome spread of street food that is served here. The Kutchi cuisine is definitely not the run-of-the-mill sweet Gujarati cuisine that is found everywhere else in this state. In the Kutch, the sweet is minimal and so is the oil (which makes this very healthy) and often eaten along with garden fresh green chilies. Jowar and Bajra are the staple diets in these villages and when eaten along with garlic chutney, osaman chutti khichdi and buttermilk, one will have the real taste of Kutch to last a lifetime. If you have just stepped out of your tent to sample some of the street food here, then fresh green channa roasted along with its pods is just the right starter to open your innings. Vada Pav might be a Maharashtrian street food but at Kutch, it is liberally dunked in butter and garlic chutney and served along with mini chili pakoras. Dabeli is a spicy popular street food in Kutch that comes in different mouthwatering flavors and is a definite must-have. The explosion of taste that one experiences in this cuisine is a unique prospect that is sure to lure you back again and again. While there is much and more to see and experience at the Rann Utsav, White Desert Festival, there are also many interesting destinations to explore in and around this area. Aina Mahal (Palace of Mirrors) located near Hamirsar Lake in Bhuj is a fascinating place to visit. A 250-year-old palace built with delicate Venetian glass and decorated with elaborate candelabra provides a glimpse at the opulence of yesteryear Maharajas. Kala Dungar is the highest point in Kutch offering a fantastic panoramic view of the Kutch. The breathtaking view that you will find at the end of this is certainly worth the climb! Vijay Vilas Palace is yet another must-visit place in Kutch. Elaborate and opulent, this palace was built in 1929 and is a magnificent fusion of local Kutch, Rajasthani, and Bengal architectural style. Mandvi Beach is yet another crown jewel on the Kutchi tourism. A serene and calm beach located on the banks of Rukmavati River, it is but 1 KM away from the Arabian Sea in the Gulf of Kutch. Now, what’s a festival without a wee bit of shopping? Rann of Kutch is a haven for handicrafts. Embroidery, block painting, wood carving, silver jewelry, seashell toys, clothes, shawls… a veritable ethnic paradise for all those shopaholics. However, it would be wise to negotiate and bargain as much as possible as is the tradition at Indian flea shops. Even better would be to go along with a local person to help in negotiations. 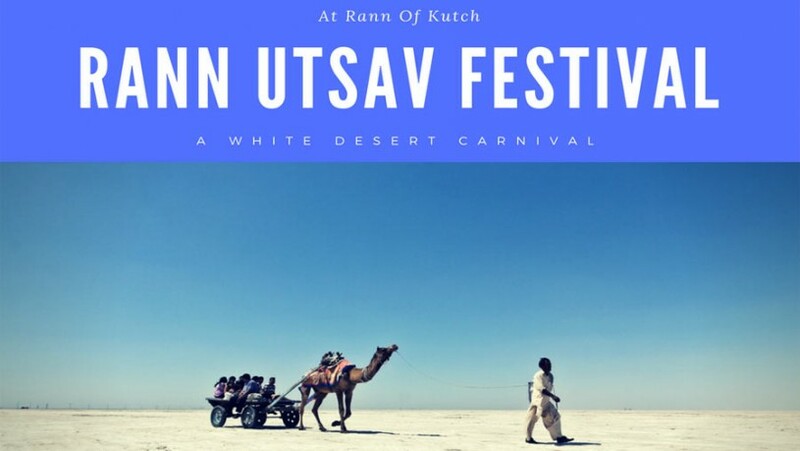 No… Rann Utsav, White Desert Festival is not just about enjoying one’s self in a swanky tent in the desert and nor is it food, sightseeing or shopping. There is much more in the offing. Here are a few activities that you can indulge in here – Camel rides or camel cart rides, especially on a moonlit night, is magical here. Many tourist companies also offer Golf Cart, ATV Ride, Camel Cart Excursion, Paramotoring, Meditation and Yoga as a choice of activity here. Rann of Kutch is a magical place and it is as vast as the sky and one can’t really experience everything that it has to offer with just one visit. One needs to visit the place again and again to savor the manifold delights of culture, heritage, and history that are on display here.